Gesture drawing is a great exercise for anyone who wants to try daily art but hasn't usually got time. A gesture drawing is done and complete within a set time, one to five minutes. Often professional models warm up with "gestures" -- one to five minute quick poses the artists race to capture before they move. 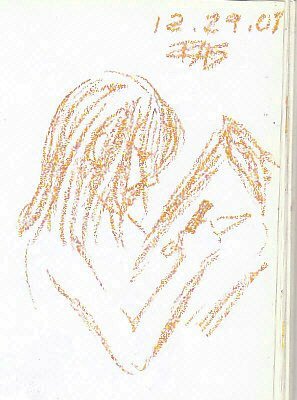 Above is a sketch I did of my granddaughter, Sascha, in about two minutes while she was concentrating on drawing a dinosaur. I didn't copy her drawing in miniature in it, though if I wanted to develop this into a portrait of her I have enough information to do so. I can always take one of her dinosaur drawings off the fridge, turn it at an angle and carefully draw what I see. I didn't bother with her clothes, just guessed at where her upper arm was. The little blouse she was wearing was complex with a lot of fluffy details on it. I kept my focus on her and though she moved her head a few times, she stayed mostly in profile. I started with a yellow ochre oil pastel thinking that she might sit still longer than that and I could do a more thorough study in color. Nope. Five year olds fidget as easily as they breathe. Two minutes after I started she turned grinning and giggling to show me her dinosaur, point out its eyes, each of its legs, its tail and its mouth. This drawing is the artist's equivalent of grabbing your phone camera to snap a quick reference. I did get her head to body ratio more or less right. I did get her arm length more or less right even if the line of her upper arm is off. I got her profile fairly accurate and in a serious painting, you would see her cheeks between the loose clumps of hair coming down next to her face. I did accurately place her ear and get the natural shape of her head, the fall of her hair and its texture. Lots of information for a quick little sketch done before the child moved. She went upstairs for her nap in five minutes after having shown off the dinosaur to mom and dad, then with much care moving around my refrigerator magnets to hang it on the fridge in my room. Don't stop, don't fix, just keep going! The trick to successful gesture drawing is to go fast without worrying about mistakes. If you put a line wrong, leave it there and put the right line next to it. If you don't have time to finish the subject before they move or before your time is up -- just leave it as it is. Don't try to complete it or add detail. 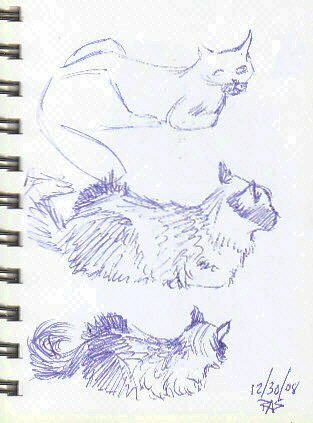 Above is another page of the same small 4" x 6" sketchbook with three gesture drawings of my cat, Ari. He was laying down in a pose that I thought was interesting, his knees and shoulders sticking up from the curve of his back. My first gesture sketch was awkward and almost geometric. He watched me with a mildly annoyed look on his face suspicious that I was about to produce a digital camera and zap him with the flash, but I got it down in a bit under a minute. He got up, turned his back and stalked over to the food dish for five minutes of crunching. He came back to lay down in the middle of the floor again in a similar pose. I carefully picked up the sketchbook and roughed in his shape. After the first gesture drawing, I could get the shapes of his hips, back and head a bit smoother, using strokes that followed the direction of the fur. He stayed in the pose for about two or three minutes, then he sat up, fell over on his rear and started washing between his legs. I relaxed and did something else, thinking my cat-drawing session was over. He padded around, drank some water, ate some more food, came up for some snuggles, wandered back to the middle of the floor and laid down in pretty much the same pose for a third time! That cat was teasing me. He looked right at me as if to say "Okay, you can try one more time -- but no flash, all right? The drawing thing is Allowable if you don't take too long." Having drawn him twice before within half an hour, my hand and eye were very familiar with his shape in that pose so I flew over the drawing, getting in every basic shape, then started scribbling in the direction of his fur and light and dark areas in his markings. I think he gave me four or five minutes on that last one, he was feeling patient and affectionate. When I finished, of course he got up and jumped in my lap to lay on top of the sketchbook. "Drawing's done, Dad. Time to pet the cat. I want some loving for all those long poses I did for you." He got it too. Don't feel bad if your gesture drawings look crude, misproportioned, sloppy or unfinished. The way to improve them is to do a lot of them at different times of different subjects. Whenever you can, try to draw the same thing in a gesture so that you get the kind of practice I did with my three feline gestures. Something you noticed the first time will get on the page faster in successive tries. Draw your own hand in a gesture drawing. Just put it down on the table and sketch it in fast, with as few lines as possible. I'm going to do that one right now without practice to show you what I mean, whether it's ugly or good does not matter. The point is to do it fast and really look at what you're drawing. Yes, I meant that -- get sloppy! 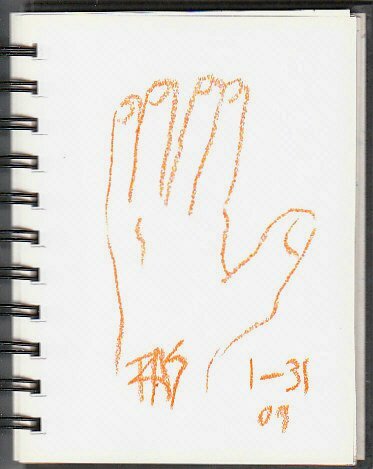 I laid my left hand on the arm of my chair and drew quickly for one minute with a Raw Sienna oil pastel, Maimeri Classico. The firm texture and high pigment saturation of the Maimeri helped to get a strong line. Notice the strong line wobbled all over the place. Observe the finely proportioned gorilla thumb there stuck onto a hand way too small for it. If you saw a photo of my real hand, you would also notice that I got the finger lengths wrong relative to each other. I left out the creases for the joints. I left out the knuckles. I got in one dashed shadow for an interesting vein on the back of my hand right after I did that first accurate-shape left side line. The giant gorilla thumb is well shaped if outsize and a little exaggerated. It's okay. Seeing these mistakes, if I were to draw my hand again I would allow more space for my fingers and make the thumb smaller. I'd keep the shape but de-exaggerate that bony prominence of the base joint. I might even get the finger lengths right. A dozen of them and I'd be doing my left hand recognizably accurate, each one would improve. What I would most likely do is change the position of my hand though, make a fist or hold a ball or a pencil with it. Part of the problem here is that the pose is dull and unexciting, a hand at rest. Gesture drawing is a good daily exercise for people who want to become good artists but have trouble even making half an hour or fifteen minute sessions every day for art. It's much easier to steal one to three minutes out of the day and get used to doing a gesture or two of whatever's in front of you while you're on hold than it is to try to cram an hour or half an hour of art practice into a busy life every single day. You can use any instrument for gesture drawing or any paper. I've done them on phone pads in ballpoint. The page of three cat gestures was ballpoint. Pencils are fine too. It doesn't have to be anything that erases. When I use oil pastel for gesture drawing it helps because the line is so broad I do not lose myself in trying to capture minute details. I'm more likely to go bold and get the essentials down on the page. 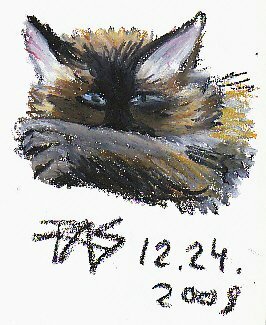 My last gesture drawing is a five minute study of my cat's face. He was laying on the bed looking at me with his eyes half open and his paw in front of his muzzle, completely relaxed. Develop it into a full shaded study if you have time. My initial gesture drawing of my cat's face and front paw only took a minute or less. He didn't move, so I started shading it in rapidly with black to get down where the blackest part of his markings were. It's something I am learning to memorize about his markings, his mask changes colors the farther it gets from his nose. Another minute went by. I got his forepaw in with a stroke or two and then started filling in with the lighter colors, brown and gray. Because I used oil pastels, I was able to fill areas fast with bold heavy pressure strokes. I went over the previous areas to shade them and didn't look back. The light blue I put into his eyes got a little grayed from the black around it. If I had planned this as a color study I probably would have done his eyes first -- but I might not have gotten such an accurate rendering of his face if I had. Instead, I was able to adjust the outline of his cheek fluffs and forehead as I added more color. It came out a good short study of my cat's face in a coy pose and I captured something else that I love about his fur -- the sheen on his dark paw when the light highlights it and makes his toes distinct. This is one of many studies of my cat. When I've done many more of them, I can bring them all together and start developing the sketch to go under a serious oil pastel painting -- one where I do include his whole body and put him into an interesting setting. I don't need to try to lure him into the setting or convince him to stay in the pose for an hour. It's possible to use gesture drawings as initial sketches for serious art by looking at them and remembering what worked and didn't work in each one. Combine the best of many of them and keep drawing from your sketches, then do more gestures of the subject. Even if you have a wiggle-puss like my cat or my granddaughter, you will eventually get the likeness! Most of all, your serious art will improve faster than you expect. Accurate gestures come first before all the fine details, once proportion and gesture are right the little details flow easily and are placed better in relation to the whole -- and the painting. It's easier to put together a composition if you have practice with your child or a rose or your cat before doing a serious painting. In a gesture drawing you can place it too high, run it off the page, put it too low or too small for a big page and it won't matter. So make a little time for gesture drawing on a regular basis. You won't regret it!